**** AT OUR SEVIERVILLE LOCATION **** The Toyota Camry has been America's best-selling car for past few years. That's an important title for auto manufacturers, so Toyota is quite pleased that the Camry has outsold the Honda Accord and Ford Taurus, its arch-rivals among mid-size sedans. Now comes a completely redesigned Camry for 2002, making this the fifth generation. This year's Camry is a slightly larger car. Yet performance and fuel economy have been maintained. Styling is all new, designed to add sensuality to what has been a bland design. Given Toyota's reputation for quality, durability and reliability, the new Camry will once again prove to be the ideal car for about 400,000 new-car buyers a year who don't want to worry or even think about their car. The Toyota Camry is one of the best-selling cars in America. The coupe and convertible versions of this car carry the Solara badge and unique styling. 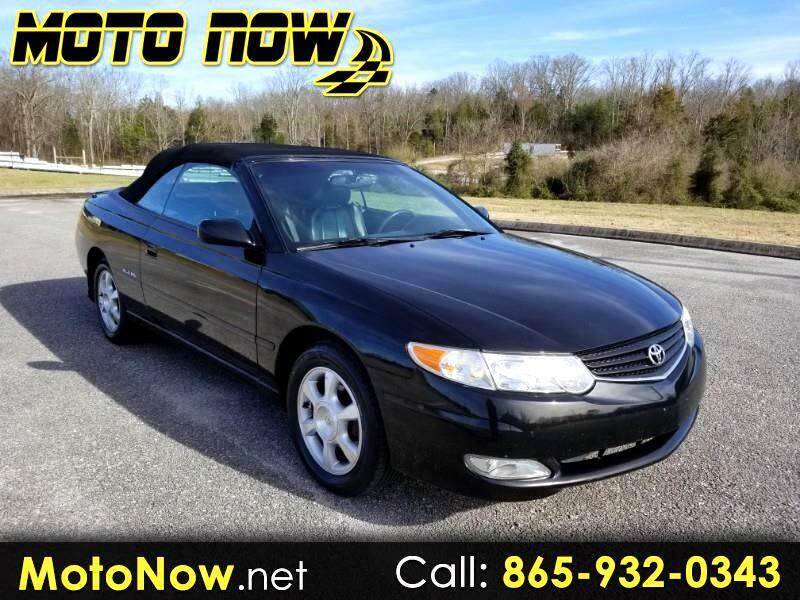 But while the Camry moved onto a new-generation platform for the 2002 model year, the Solara carries over on the previous platform. However, the Solara coupe and convertible do get a facelift for 2002, with a new grille, front bumper, headlamps and tail lamps. A new four-cylinder engine for 2002 delivers significantly more power over last year without sacrificing fuel economy or emissions. Overall, the Solara is smooth and quiet. Its optional V6 delivers strong torque for good acceleration performance. It's comfortable, with terrific seats, and the top is easy to operate. LE was always the most popular model. This year, it comes with a lot more standard equipment, including air conditioning, power windows, power locks, power mirrors, cruise control, 60/40 split rear seat and vanity mirrors. However, Toyota hopes that more people will be interested in the luxuriously appointed XLE as it is not such a jump up in price from the LE as before. XLE adds luxury appointments such as wood grain trim, power driver and passenger seats, automatic air conditioning, alarm system, keyless entry, cargo net, and rear-window sunshade. SE is a new model, a sportier version of the LE with added equipment such as fog lights, stiffer suspension, bigger wheels and tires, rear spoiler and sportier trim inside and out. Each of the three models can be had with a newly redesigned four-cylinder or V6 engine. Manual transmission is only available on the LE and SE four-cylinder models. The list of option packages is quite long, enabling buyers to order a Camry to suit taste and budget. Side airbags are available as an option on the LE and SE, but are standard on the XLE. (Note: The 2002 Camry Solara coupe/convertible is still based on the old Camry platform even though it has a few small cosmetic changes to make it look more like the new Camry sedan.). The Solara comes in hardtop coupe and convertible body styles. It's available with four-cylinder or V6 engines and manual or automatic transmissions. The four-cylinder coupe is available only in the SE trim level, $19,365 with a five-speed manual transmission and $20,165 with a four-speed automatic. Standard equipment includes an all-new 157-horsepower 2.4-liter engine, air conditioning, front disc brakes, cruise control, fog lights, an AM/FM radio with a cassette player, 15-inch wheels and tires, cloth seating and front airbags. The V6 coupe is available in SE and SLE trim levels. SE V6 with five-speed manual retails for $21,685; SE with automatic transmission retails for $22,485; SLE, which is only available with automatic, lists for $24,675. Both are powered by a 200-horsepower 3.0-liter V6 and have four-wheel disc brakes with ABS. The SLE adds leather seating surfaces, automatic climate controls, heated rearview mirrors, a JBL premium audio system with a CD player, front bucket seats with eight-way power on the driver's side, a rear spoiler, 16-inch alloy wheels and 205/60R16 tires. The convertible is available as a four-cylinder SE ($24,495), or a V6 SE ($28,045) or V6 SLE ($30,525). All convertibles come with automatic transmissions. The convertible top raises and lowers under its own power and features a heated glass rear window. Message: Thought you might be interested in this 2002 Toyota Camry Solara.